Mark your calendar ‒ Tudor City Greens' Christmas Tree Lighting ceremony is this Thursday, December 7th, in the South Park at 6:30 pm. There will be caroling. 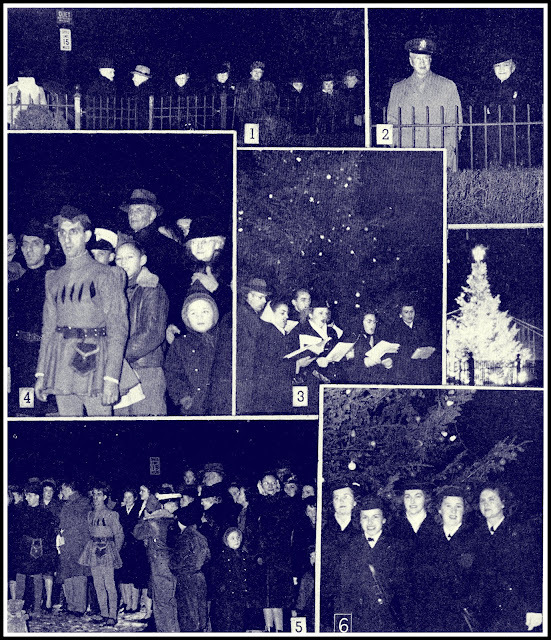 Tudor City's first tree-lighting takes place in 1927, the year the complex opens. It's been an annual event ever since, save for one hiatus in 1942, when wartime jitters lead to a citywide dim-out that includes Christmas trees. Below, how they did it in 1944, complete with a choir, carolers, knaves, Waves, and a burning Yule log. It's taken from Tudor City View, the enclave's monthly magazine. Another date to add to your calendar: Tuesday, December 12th at 6:30 pm, when the Chanukkah Menorah will be lit in the North Park. This Tudor City tradition is now in its 26th year.